Pau Gasol was dishing out nine assists and Vladimir Radmanovic drained five threes as the Lakers cruised past the Phoenix Suns Thursday. Vladimir Radmanovic, who had people wondering if he should still be in the starting lineup because of his shooting slump, went five of five from three point range Thursday night in Phoenix. It was just that kind of night for the Lakers, who had six players scoring in double digits and as a team shot 47% from three on their way to a 105-92 win on the road. The win improved the Lakers to 9-1 on the season and was another convincing win against one of the best teams in the West. “It’s definitely a confidence builder, against a team like that because they are a really good team and we are on the road,” said Trevor Ariza, who had 10 points. Kobe Bryant tried to take on too much of the offense early leading to misses, but had seven key early third quarter points and finished with a team high 24, on 8 of 25 shooting (he did get to the line nine times). Radmanovic added 15, Lamar Odom had 13, Jordan Farmar added 11 and Andrew Bynum joined Ariza with 10 points. 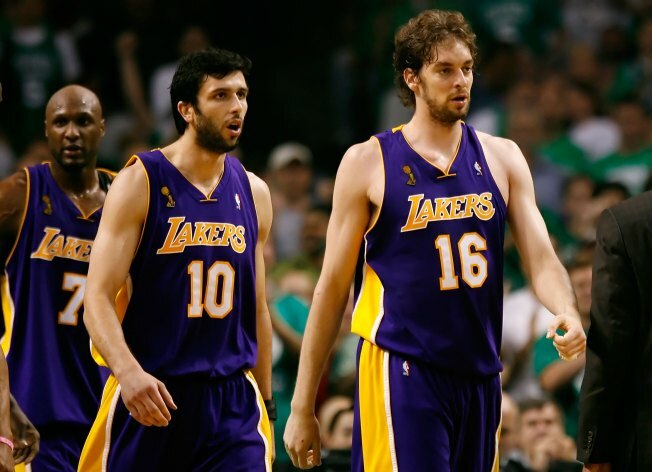 Pau Gasol had just four points but had a team high nine assists and nine rebounds (Odom also had nine boards). The Lakers took control at the end of the first quarter with a 14-0 run sparked by the reserves. The Suns responded with a run of their own, but that Lakers took control for good when Kobe Bryant returned to the game and started a 12-2 run midway through the second quarter. The Lakers cemented their halftime lead with a 13-5 run early in the fourth quarter, putting them up by 12. They maintained a double-digit lead for the rest of the game, and the Suns never seemed a threat to make a real run. Amare Stoudemire led the way for the Suns with 21 points, but Gasol and Odom combined to do a good job on him defensively, limiting to 8 of 21 shooting on the night. Shaquille O'Neal added 15 points and former UCLA Bruin Matt Barnes had 12. Steve Nash finished with 8 points and 12 assists. Not much rest for the Lakers, who jumped on a charter flight after the game and returned to Los Angeles for a game against the hot Denver Nuggets Friday night at Staples Center.